Even Royals fans know this is an out. I do not acknowledge the supposed results of the 1985 World Series. As far as I’m concerned, the series is still in game 6, bottom of the ninth, pending a review of a play at first base. Given that video replays clearly show the runner is out at first and umpire Don Denkinger made the wrong call, I believe that the game stands at one out with bases empty in the bottom of the 9th inning. Now unlike many Cardinals fans, I’m not going to say that this call absolutely cost the Cardinals the World Series. They still had two more outs to go, and who knows what would have happened after that. It it certainly possible the Royals would have rallied regardless. However, in the same breath, with the correct call the Royals would have remained down by a run with no base runners and only two outs left. It doesn’t take a baseball expert to surmise that a team in the World Series two outs away from winning with their dominant closer on the mound has the odds clearly on their side. 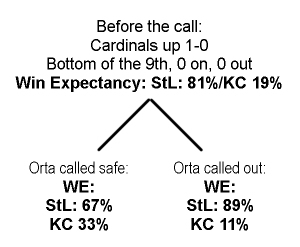 But just to emphasize the point, an article written by a self-professed Royals fan analyzing the percentages show that the Cardinals’ chances of winning the game would have gone from 81% to 89% if the correct call had been made. 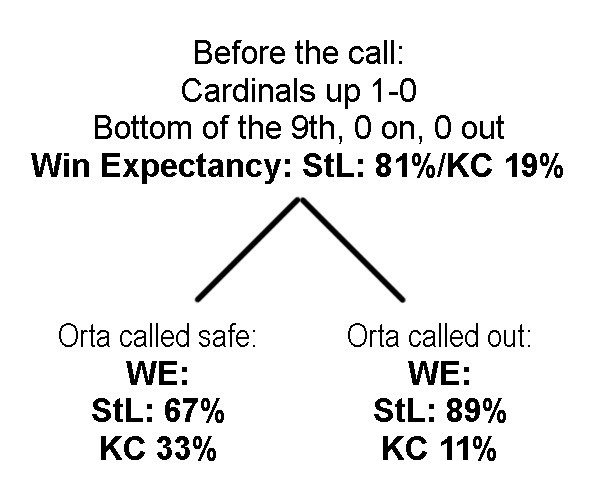 Instead, the Cardinals’ chances of winning changed to only 67% with the blown call. Many Royals fans will argue that the Cardinals still had the odds on their side and therefore “the call” can’t be blamed for the Cardinals losing, but the effects of such an unprecedentedly bad call on the psyche of a team can’t be ignored. Let’s put a little perspective on the magnitude of the call made by Don Denkinger. Umpires make bad calls all the time to be sure. However, rarely are bad calls so irrefutably wrong. Rarely are bad calls made in a game and situation of such importance. Rarely do bad calls so directly affect the outcome of a championship. As I mentioned, all the TV replays showed the call was wrong. The announcers couldn’t believe the call. After the game, the commissioner of baseball told Denkinger that the call was wrong. The call was so bad that Denkinger himself later admitted he made the wrong call. This wasn’t just an ordinary bad call. It was an epically bad call in the tightest of games. This was a bad call of historic proportions. Given the situation, it is perhaps the worst call ever in the history of baseball. It is fairly obvious that the Cardinals just weren’t the same team after that call and it is hard to blame them given the unbelievable situation. Unfortunately we will never know what would have happened if the play had been correctly called and the game would have continued like business as usual. I’m a big believer in Karma. I think Karma can even extend in ways that are hard for us to fathom. Therefore, I do not think it is coincidence that the Kansas City Royals, who had not played a postseason game since that fateful 1985 World Series, finally made it into the playoffs this year – the very year that instant replay was finally introduced into Major League Baseball. 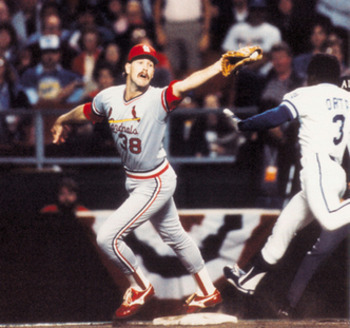 Had instant replay been available in 1985, Don Denkinger’s colossally bad call would have been easily reversed and the series would have wrapped up without controversy. Maybe baseball Karma was at work and the Royals were destined to not play in the postseason until instant replay could prevent a bad call from influencing a series like it did in 1985. Could be. Just maybe. Baseball is a strange sport like that. Given we can’t go back in time, this is the way it should be. Like I said above, even with the odds squarely in their favor, I’m not going to claim that the Cardinals are the rightful 1985 World Series champions. Even if the call had been correctly made or reversed, they still had two outs to go and without the benefit of a time machine, we can not go back to find out if they would have closed out that game. 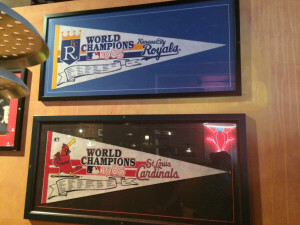 However, it is a stretch to say that the Royals can rightfully claim the 1985 crown. The bad call and ensuing brouhaha gave them a significant unfair advantage. So how do we resolve the situation? It wouldn’t be right to strip the Royals of the title and give it to the Cardinals, but we can’t ignore the monumental umpiring error that possibly robbed a team of a championship . 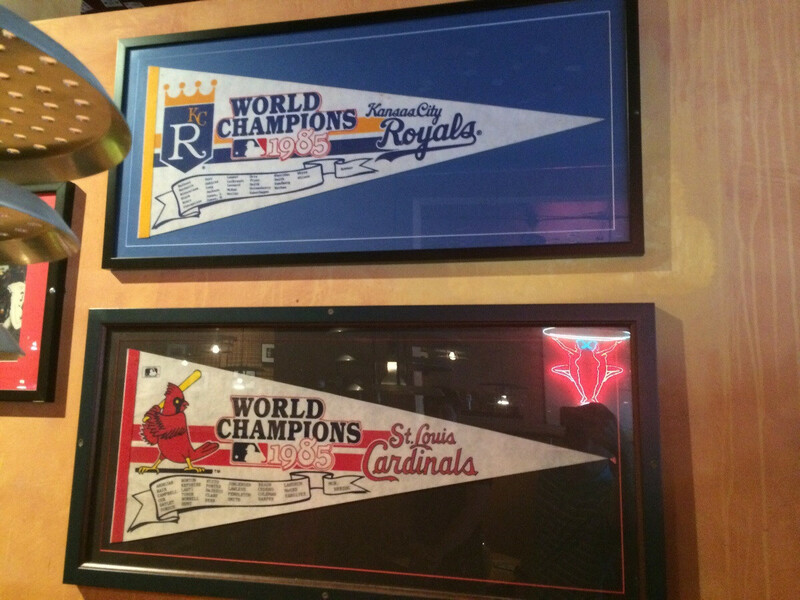 The best I can come up with is to acknowledge both teams as 1985 World Champions. In this year of instant replay, we should attempt to right what once went wrong. 29 years later we can’t apply instant replay and resume game 6 of the 1985 World Series, but we can retroactively acknowledge the egregiously bad call that completely changed a series. 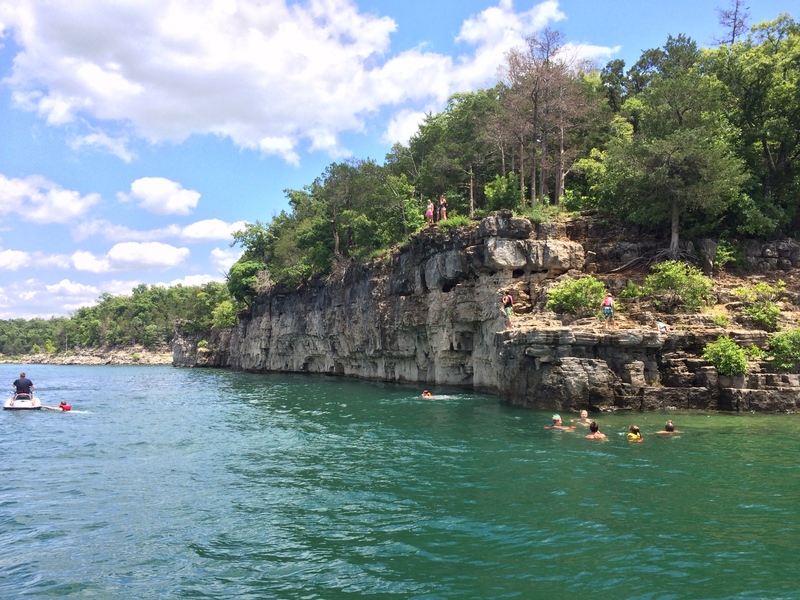 That’s the cliff I jumped off. Yes, from the top. Other than my immediate family, not many people are aware that I have a bit of a fear of heights. Now it’s not a debilitating “phobia” as others may actually suffer from, but I certainly get strong feelings of anxiousness when looking out from tall buildings or over railings. Sometimes even driving over long or tall bridges gives me “the willies”. It’s enough of a fear that I will make a little effort to avoid it when possible, but not so much that it actually interferes with “normal” situations. I had the good fortune to take a lake vacation for the week of July 4th with some friends on Lake Norfolk in Arkansas. One of the activities available is jumping off a cliff into the lake. There is a short section about 10-12 feet to jump off and then there is an approximately 35-foot jump from the top. Joining my kids, I had no problem jumping off the 10-foot section. But we were all curious about the 35-foot jump. My 12-year old daughter especially, who is a big fan of the Divergent series, wanted to try the jump to emulate the initiation of the Dauntless faction. We went up to the top section and took a look. Surprisingly, the view over the edge didn’t make the hair on the back of my neck stand up – not that there is actually any hair on the back of my neck, but you know the feeling! So my daughter and I talked and we both decided to face our fears and take the leap. The hardest part was making the jump. The rest was easy. Not that I had enough time to think about anything but trying to hit the water feet-first. It was over so quickly that I don’t really remember anything except the view of my legs clearing the cliff – that and hitting the water. I mostly landed correctly and splashdown really didn’t hurt. Although who knows how much adrenaline was pumping through my veins! I made room for my daughter to jump. Unlike me who took several minutes to finally leap over the cliff, she hesitated just once but then went for it. It was nice to have a shared experience like that, especially when conquering something that is one of my only fears. I rode high on that the rest of the day. It’s not every day we get to push our own limits and I’m glad I was able to pass this particular test. I’m not usually one to let things easily bother me. It takes just the right provocation to actually make me feel anything resembling anger. However, when I watched the viral video “Look Up” by Gary Turk, it pushed my buttons. Sure, there has been much written about people getting lost in technology such as this article called Dear Mom On The iPhone that gets passed around every so often. There is definitely a simmering backlash out there against all the new technology introduced in the last several years. But there was something about “Look Up” that was just exasperating to me. It went too far. I couldn’t let it go. I knew that it was time to fight back against the technology backlash. So to quote Samuel L. Jackson from Jurassic Park, “Hold on to your butts”, because things are about to get real! Frankly, I’m sick and tired of all the whining and complaining regarding The New World of Technology that we live in today. Whether it’s someone bitching about people taking too many pictures or people looking at their phones too much or people spending too much time on Facebook or people playing too many video games, the level of antagonism towards technology in general has gone far enough. I’ve had it. Especially when a lot of this teeth-gnashing is being done on social media, being posted on YouTube, or being written about on a freaking blog! I get it. Technology is changing things. Very rapidly. I’ve written about it before – that the last 6 or so years has seen technology disrupt our society unlike at any time before. Change is scary, I know. People like to complain about change. This isn’t new. But usually the stereotypical scene here is a couple of old people sitting on their rockers grumbling about their ailments and how those young whippersnappers just don’t have any respect. Now it seems that young is the new old and anyone over the age of 30 is eligible for old-timer syndrome. Now let me have some empathy here first. Yes, there are many people out there that are in fact clinically addicted to their mobile devices or video games or using social media. They should seek out professional help. Then there are legions of people that are not truly addicted but probably spend an inordinate amount of time using technology of some sort. People that are in this situation should be encouraged to practice some moderation. But there’s a difference between gently encouraging someone and browbeating them into submission like “Look Up” tries to do. The reality is that true encouragement will work a lot better than bullying someone into compliance. In fact, attempting to harass someone will likely cause the opposite reaction, as anyone can tell you that forbidden fruit tastes the sweetest. To those that like to complain, what does it really matter to you anyway? Focus your energies on improving yourself and quit trying to run everyone else’s lives. You’re only making yourself seem totally out of touch and simply marginalizing your influence. The fact that technology is so mobile now allows people to interact with it on an almost constant basis. Where in the past technology virtually chained us to our desks, we now use our technology out in public like never before. This is where I think those with curmudgeon-like tendencies get their knickers all up in a twist. It’s out there in their faces now. Everywhere one turns they can see The New World of Technology. Not only in real-life but all over traditional media now too. They can’t get away from it. The old human nature of being afraid of what we don’t understand kicks in. I feel their pain. But frankly, those of us who are making use of new technology are tired of listening to the grumbling. If you don’t like it, then don’t use it but leave the rest of us alone. Perhaps the greatest thing about mobile technology is that it gives us access to the Internet anywhere we are. 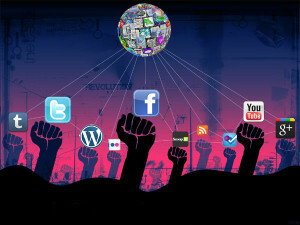 There is so much we can do with the Internet from communication to research. Literally it is the world at our fingertips. Saying someone is addicted to the Internet is like saying someone is addicted to communication. It’s like saying someone is addicted to learning. It’s like saying someone is addicted to life. Now as I said before, there are people that probably do spend too much time using technology. For those who think that’s a big problem, just have some patience. Society as a whole behaves very similarly to how individuals behave – just on a longer, drawn-out scale. Visualize a kid who has just received a new toy that they’ve been wanting for a really long time. At first they seem addicted to it. They’re constantly playing with it. Maybe they even go too far and play with it when they really shouldn’t be or stay up way past bedtime because they don’t want to stop playing. Maybe they even sneak it into places they shouldn’t. But as with most things, they eventually get out of the “shiny new toy” phase and stop playing with it as much. Or as they mature in general they learn moderation. How the parents react to shiny new toy syndrome will go a long way in how a child will develop. If the parents come down hard, it usually only makes the child want to play with the toy more. If the parents chastise the child, the child will still want to play with the toy, but now they’ll go to lengths to hide their play. Either way, the child loses some respect for the parents as they feel the parents just don’t understand and aren’t making an effort to do so. However, if the parent takes the time to understand why a child loves a toy so dearly and patiently teaches the child that sometimes there can be too much of a good thing, the child will probably be more likely to learn and practice moderation going forward. I believe society is in the shiny new toy phase with The New World of Technology. It has moved so fast we are still figuring out the new rules of the game. Or more precisely, we are making them up as we go along. To make things harder, technology continues to change right out from under us. Just when it seems we have a handle on things, new services like Pinterest or Instagram added to the constant stream of new devices being introduced totally change the nature of the beast. Everyone, especially those complaining the loudest, better buckle up because as a technology professional I guarantee you we’re just getting started. Instead of complaining, I would encourage you to look at the bright side of all this new technology. Playing games stimulates imagination and provides a motivation for learning. Video games truly are no different than traditional games in this regard, except that the evolving nature of video games has opened up exciting new opportunities. In many ways, I believe video games are a new form of classic storytelling. Where older generations revered their books and movies, younger generations hold the same adoration for the adventures they find in their video games. People today don’t need to just read about exciting worlds, they can virtually be part of them. I know it can be hard for older generations to grasp this concept. Video games seem so childish and a waste of time to many. However, chastising the playing of video games only serves to prove just how out of touch you are. Spending time on social media is a true and valid form of communication. Just because it is a new way to communicate doesn’t make it any less legitimate. In a world where a lack of communication is endemic, discouraging communication is highly counterproductive. Sharing our experiences through photos is another form of communication. Just because you’d rather “take it all in,” don’t try to diminish how others prefer to capture their memories. Again, you only serve to remove yourself from their relevancy. At one point in our history, we could only communicate with others who were in our immediate vicinity. Then the telephone changed all that. We could literally get in touch with anyone across town or around the world. I’m sure many people back when the telephone was being introduced thought that phone calls were not a natural thing and spending too much time on the phone was bad. Growing up in the 80’s, I know the stereotype was teenage girls getting yelled at by their parents to get off the phone, so this “problem” spanned generations. Today a lot of voice conversation has been replaced by texting and social media, but the core complaint still hangs around. Social media, just like the telephone before it, does in fact allow people to connect. Just because it isn’t necessarily “in real life” doesn’t mean those connections aren’t real. In fact, social media allows more people to connect in meaningful ways. Just like the telephone could allow family members who lived in different countries to verbally communicate where it was impossible previously, social media allows people to connect with people from around the block or around the world in ways that were not possible prior. With mobile devices, this level of communication is now possible anywhere, anytime. Sure, we are still figuring out the etiquette for this new medium. But instead of complaining, help set the new rules. Be open-minded and understanding and you’ll get a lot further. There’s no balance in his video. Watching it you’d think that technology was destroying the human race and we need to rid the world of this menace. But most reasonable people know otherwise. 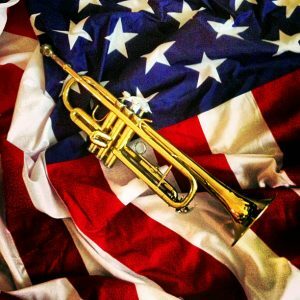 Whether it was listening to rock n’ roll, watching TV, playing pinball, playing arcade games, or whatever the new thing was at the time, I’m certain many people remember being told that those things were bad by the older generations of their youth. Which only makes it more surprising that they are turning around and doing the same to the young generations of today. The main difference is now technology has moved so rapidly, that otherwise young generations are already feeling passed by. What is truly interesting is that chronological age isn’t even the true gauge of potential curmudgeon status. What is seemingly more important is how comfortable one is with technology. People in their 30’s and 40’s show a wide range of technology experience so it isn’t unheard of for younger individuals to act like stereotypical grumpy old nags towards others who are actually older. In fact, Gary Turk is only 27. Act your age, Gary! Technology has driven our civilization forward since the dawn of time. Whether it was stone tools or quantum computing, the technology that humans create virtually define us. To take such a hardline stance on new technology only serves to create divisions where none need to exist. Whereas older generations may feel a level of ambivalence or even animosity to new ways of living and communicating, younger generations have no such reservations and devour these new methods with abandon. They have no reason to feel otherwise. Young people strongly identify with their technology and the way they use it. But when they are told that the things they enjoy aren’t “the right way”, they’ll push back. They’ll lose respect for those that attack the way they live their lives. Eventually they’ll stop listening. Choose your attitude carefully or risk becoming irrelevant. Let’s celebrate human achievement and what technology can do for us instead of making videos that call us “a generations of idiots” with “smart phones and dumb people”. Post by Life, Liberty, and Technology. No, I’m not “that guy” who goes out and sees a movie when it is released at midnight or anything … but yes, I did see the movie Jobs on the first day it was released. But it was mostly that the timing was right for me to take in an afternoon matinee. And besides, as a technology consultant and technology historian, I wanted to make sure to see the movie before I started getting a lot of questions – at least that is my story and I’m sticking to it! Obviously I’m not a professional movie critic, but I know what I like, so you’re going to get my take on the movie from my personal perspective and that of someone who knows the history of the personal computer era. The first scene was telling – I knew immediately what was going to happen simply from the introductory title scene – “Apple Town Hall Meeting 2001”. I knew this was going to be the iPod introduction. What else could it be? I am very familiar with the actual event, which I remember mostly because looking back now the event was very small and relatively low-key as compared to later Apple events. Given its historical significance, the event is now larger than life, but the reality is that the actual stage and auditorium was pretty tiny. When I saw the scene develop, I wasn’t sure at times if I was watching the movie or some of the actual footage from the event. It looked that accurate. I hoped the rest of the movie would be as historically accurate, and for the most part, I believe it was. I’ve already read some reviews that criticize some of the details of the film as being inaccurate. But for the most part, those details are very minor, and probably only noticeable to serious geeks. And sure, some of the scenes were dramatized, but by and large I felt the movie gave a very accurate high-level portrayal of the events that shaped the life of Steve Jobs, the history of Apple Computer during his tenures, and to a lesser degree the early history of the personal computer era. 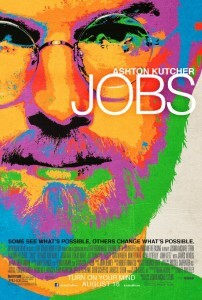 Ashton Kutcher did an amazing job of nailing the mannerisms, voice, and general persona of Steve Jobs. At times I completely lost myself in the movie, not recognizing that the person I was watching on screen wasn’t Jobs himself. For me personally, I really appreciated the scene at the first annual West Coast Computer Faire of 1977, where the Apple II was introduced. Many historians call this event the birth of the personal computer industry, as the Apple II is credited with igniting the personal computer revolution. But the scene also showed the Commodore PET computer, which was one of the three significant personal computers that were introduced in 1977. Along with the Radio Shack TRS-80 computer, Apple and Commodore defined personal computing during the earliest stages of the era, before IBM and then Microsoft rose to dominance. The only fault I could find with the movie was that there simply wasn’t enough of it. My wife is a technology layperson, relatively speaking, and wasn’t very familiar with the details of Steve Jobs’ life or the history of the personal computer era. After watching the movie, she said that she wanted to know more about how Steve Jobs matured, especially in the time where Steve Jobs wasn’t at Apple. I couldn’t agree more. The film literally spends 30 seconds bridging those twelve years, never mentioning Pixar, and only mentioning NeXT to segue Jobs’ return to Apple. This time period in Jobs’ life is absolutely critical, as he matures both as a person and a business leader. But it’s hard to fault the film for this. It was already a two-hour movie and I know that most movie audiences get squeamish at anything longer that 90 minutes. My wife mentioned that it would have needed to be a mini-series to cover his entire life. Perhaps, but I would not have minded a three-hour movie that filled in some more gaps and gave a more complete picture. Overall, even if the movie feels like a “cliff notes” version of Steve Jobs’ life, I still think it is a worthwhile movie. For most people who know very little about Apple prior to 2001, I think this is a great introductory look at the man that made Apple and quite literally changed the world. Sure, it’s not 100% accurate and it is a little thin on details at times, but it serves its purpose, at least from my viewpoint. I hope it helps more people understand the passion and drive that Steve Jobs had and how his influence shaped our technology, no matter if it is an Apple product or not. Ultimately the technology industry that he helped define and drive forward has influenced our society so greatly, that we all would do well to study his life as we study the life of other great people in history. Oftentimes, I find that entrepreneurship and liberty are inexorably intertwined. Sometimes, even the terminology used seems to hint at this unalienable truth. A shout out to Amanda at amandabillyrock.com for bringing up a discussion about the freemium business model. I’ve recently discovered her online and I must say her writing reads as if they are thoughts coming from my own mind. Check her out if you haven’t already. I won’t go into too much detail about the freemium model or argue the merits. Lots of other people have done that. But core to the model is the idea that information is given away for free, in order to develop a following and establish oneself as a category authority. Of course, “free” as in pricing is different than “free” as in liberty. Yet for many, the belief that information should be free covers both cost and availability. This is one place where entrepreneurship and liberty intersect. Certainly I believe that the free flow of information is the greatest gift the Internet has given us. The decision to get paid for information I leave up to each individual. But in the age of the Internet, consider the following. Those who set information free are viewed in higher regard. Perhaps one day we will look at the liberation of information as a turning point in human history. 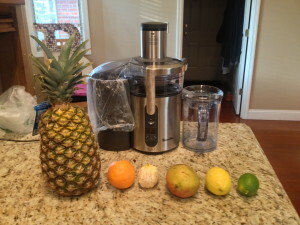 1 pineapple, 2 oranges, 1 mango, 1 lemon, 1 lime = Yum! Day ten of my ten day juice fast was unlike any of the others before it. Whereas most days I juiced several times per day, today I had pre-juiced the night before and brought it all with me. Only at dinner did I actually make juice. While preparing to make juice, I was talking to my wife and explaining how it felt weird knowing that this was the last time I would prepare juice for my juice fast. It was strange feeling of accomplishment mixed with sadness. While I felt relief knowing that I no longer needed to be on a strict juice diet, I sort of felt sad that this journey was ending. I wonder if other people juice fasting have this feeling at the end of their journeys as well? Regardless, I completed my juice fast and now I am free to eat whatever I want. So the day after my juice fast what did I have for breakfast? My wife made juice so I had some! That and a boiled egg. For lunch I had some leftover juice from the night before. I also snacked on almonds and raisins through the afternoon. For dinner I plan to not drink juice for the first time in 11 days! As I write this, I’m waiting for my wife to come home so we can go eat sushi! I started the first day of my juice fast at 188 pounds. I weighed myself this morning at 175 pounds: 13 pounds lost. My belly measured at 37 1/2 inches on day one: it measured at 35 1/2 inches this morning: 2 inches lost off my abdomen. I went from a 16 1/4 inch neck to 15 inches: 1 1/4 inches lost off my neck. My pants feel baggier and I am also able to tighten my belt one notch tighter. As I gather my thoughts over the next few days, I will write more about my thoughts on the juice fast experience. But for now, off I go to get some sushi! I was an interesting mix of excited and calm today. Excited that I only had two days left on my juice fast, but calm because I was totally confident that having gone this far, I would complete the entire ten day fast with no problems. It almost felt like day nine was the final day, knowing that I only had one day left. The biggest complication for day nine was knowing that the next day I would be out of the house almost the entire day and that I would need to prep a lot of juice to bring with me. So I had to do a lot of juicing at the end of day nine to prepare for day 10. 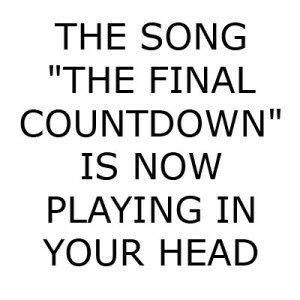 The last day is next! Bring it on! FYI, in case you’d like to know, our juicer is a Breville BJE510XL. After the crazy weekend, day 8 being a Monday was pretty much no sweat, although I almost decided to cheat on my juice fast. Let me explain. My wife and I bid on and won a charity auction item several weeks ago. The auction item was a package of Cardinals baseball prizes and events. We weren’t completely sure of all the details to the package, as some of the events take place later this spring. So we didn’t realize that as part of the package we were given tickets to a Cardinals opening game party at Union Station in St. Louis. We found out Sunday that we could go. Because a Cardinals home opener is a big deal around here and I would have liked the opportunity take some time off with my wife to a fun event, I was prepared to cheat on my juice fast at the party. I made this decision ahead of time, not because I was craving food and couldn’t handle juicing anymore, but because I didn’t want my juice fast to be a downer at a party. As fate would have it, a client emergency precluded us from going, so I didn’t end up cheating on my juice fast. This juice fast has made me realize a lot about food, our bodies, and our culture. I will expound upon more in a later posting. I was asked a question about which juicer we own. 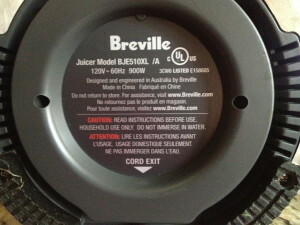 It is a Breville BJE510XL, also known as the Breville Ikon Multi-Speed Juice Fountain, which we bought from Bed Bath & Beyond last year. I’ll share a quick tip regarding buying juicers from Bed Bath & Beyond. Before buying last year, we had settled on this particular juicer after much research and recommendations. We found that Bed Bath & Beyond had them on their web site. We got excited because we had a whole bunch of 20% off coupons (if you’ve ever shopped there, you know what I’m talking about). In my excitement, I read the fine print and discovered that you can only use these coupons in-store, not for shopping on their web store. Unfortunately, they didn’t carry this juicer in our local store. However, I discovered a way that you can use their 20% off coupons to order items from their web site. What you must do is bring the coupon to a Bed Bath & Beyond store and order the item from there. A customer service person will help you with the order. It’s not exactly convenient, but I knew I was going to be in the area and it was saving us about $40. If you’re going to order a big-ticket item like a juicer from Bed Bath & Beyond and all you have are 20% off in-store coupons, this could save you a bunch of money, so keep it in mind. Forgive me for posting this the day after! Sunday was a little hectic. My main concern this day was how my body would react to two hours of roller hockey. I’ve been playing hockey on Sunday morning for about 14 years now. I am pretty dedicated so I play nearly every single Sunday, which is approximately 700 games in that timespan. I’ve learned a lot about my body from all this experience, and I’ve gotten a routine down. Since I play early (7-9 AM), I can’t really eat prior to the game. Therefore I must make sure I eat well the night before, in addition to staying hydrated throughout the day, and getting good sleep (which is sometimes tough on a Saturday night). Many years ago my wife and I tried the South Beach diet, which restricts carbohydrate intake. We lost some weight, but I could tell that it really affected my hockey playing. I simply didn’t have any energy. Experiences like that helped shape my hockey routine. So how would my juice fast affect my play? To stay true to the juice fast, I also was avoiding drinking my usual pre-game drink (a Gatorade “1” or Emergen-C), plus only drinking water during the game instead of my usual Gatorade. I’m trying to avoid any processed food or sugars. The night before I made some citrus juice of lemons, limes, and oranges to try to get some extra carbs in my body for the night. Sunday morning before I left to play I drank 8 oz of the fruit juice I made the night before, plus probably 12 oz more of water. When I got to the rink and started skating, I felt a little weaker than usual and I thought I might be in trouble. But after a little while of playing, I actually felt good. This lasted for about an hour. Then I suddenly realized I was getting fatigued. I recognized it pretty quickly. I simply didn’t have the energy I am accustomed to. I pride myself on having good stamina and being able to outlast most of the other players in the later stages of the game so I’m pretty familiar with how my body feels during hockey. This was not a good sign. I still had an hour to go and I body was telling me that it was exhausted. But there was no way I was stopping, so I played on. The strange thing was that even though I felt exhausted, I still felt good. As I substituted in and out, the short breaks allowed me to quickly recharge and get back out there. I was even able to score a tough goal toward the end of the two hours. But make no mistake, I was drained when we were done. For one of the only times I can remember, I was actually watching the clock, looking forward to the end of the game. Usually, I feel like I can still play longer, and in fact I have played additional 2 hour sessions before. 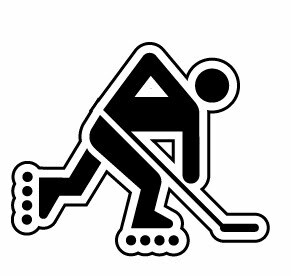 In the past when I’ve been exhausted after playing hockey, I’m totally beat all the way through getting back home, taking a shower, and getting something to eat. But this time, something interesting happened. As I did while I was playing, once I took a break, I seemed to perk back up quickly. Sure enough after I got changed and was packing up to go home, I actually felt really good. Yes, my muscles were tired and a bit sore as usual, but my fatigue seemed to be gone. I actually felt a little hyper. Driving home, I was no longer exhausted, but rather felt energized. I can only attribute this to the fact that my body is operating very efficiently because of all the nutrients in the juices. The rest of the day I drank some extra juice throughout and only once did I have a very slight headache, which was very brief as I quickly drank a juice and it was gone. I often fall asleep on Sundays after playing hockey. However, I did not this time. I wonder if juicing had anything to do with it. So I’ve now completed one full week on juicing and have survived the temptations of the weekend as well as the exhaustion of my hockey Sunday. I’ve only got three more days to go and I’m looking forward to finishing the full 10 days. My body feels good, I don’t really have any cravings anymore, and I can’t imagine that the next three days could be harder than any I’ve done so far.